The novelty lies in the body of titanium at 44 mm x46 mm mmh15. Consists of 19 components, the housing is equipped with a front anti-reflective sapphire crystal. On its back cover screw is also set sapphire glass through which you can observe the work mechanism. Has a new blue galvanic dial with orange details. Additional dial with small second hand is at position 9:00. Time display performed by central arrows hours, minutes and seconds, made of blued steel. Model SpidoLite II Titanium Blue operates on an automatic mechanism LW 04, designed specifically for the company Linde Werdelin Concepto. Calibre provides 42-hour power reserve and balance frequency 28,800 semi-oscillations. Automatic winding rotor skeletonirovan. Water-resistant model – 100 meters. Novelty is equipped with a black textured calf leather strap with blue stitching and buckle. 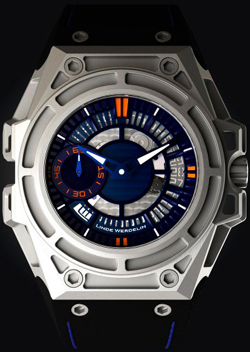 Buy watches SpidoLite II Titanium Blue is available with company officials Linde Werdelin costs 10,400 Swiss francs.